Includes 18 Pediatric Trauma CME Credits! 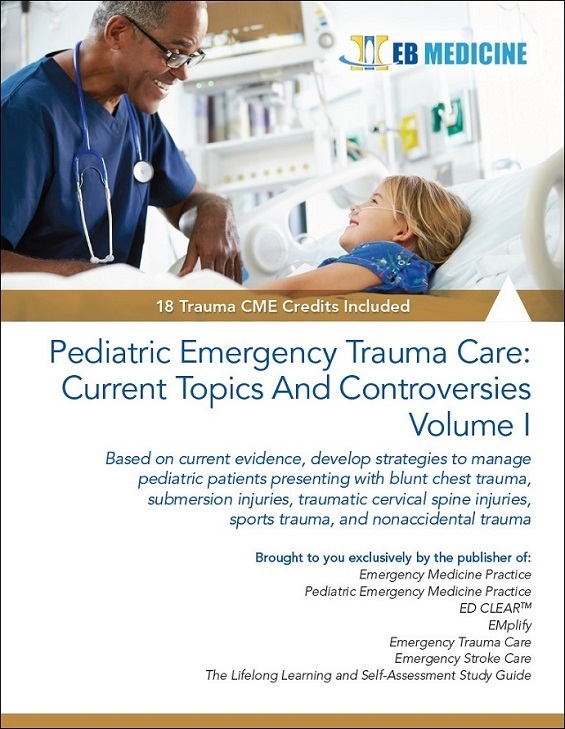 This resource reviews aspects of emergency trauma care for pediatric patients including blunt chest trauma, submersion injuries, cervical spine injuries, nonaccidental trauma, and orthopedic trauma in sports. Two issues of PEM Practice one issue of EM Practice Guidelines Update have been reviewed and updated, and two chapters of new content include reviews of updated guidelines as well as evidence-based practical information for patient management. To view a sample of Pediatric Emergency Trauma Care, click here. “Dry Drowning” – Does It Truly Exist? Hypothermic Drowning Victims: Can There Be a Meaningful Recovery? This was an excellent way to learn and refresh current, evidence-based acute-care. I'll now have better situational awareness for potential non-accidental injuries and an evidence-based approach to evaluating potential c-spine injuries.